Stop Dieting and Start Losing Weight, shares practical tips and strategies to achieve your ideal body weight. You will learn how to create your own personalized eating plan so that you never have to diet again. Author, registered dietician Jen Brewer, says if you want to lose weight you should stop dieting and start eating. She explains that when we talk about “going on a diet” we are referring to a temporary change in eating habits. But what you really need is to start eating in a way that helps your body to become healthy. To effectively lose weight and keep it off you will need to design a lifetime eating program. You can adjust the plan to suit your preferences and include all of your favorite foods, in moderation. If you love triple-fudge chocolate cake, then include that in your eating program—just not every day. Because your personalized plan is not a fad diet you will probably only lose about one or two pounds a week. However, your goal is not to lose weight rapidly but to be able to maintain the weight loss for good. Brewer outlines four major principles that will help you understand how to lose weight and keep your body healthy. If you consume less calories than you burn you will lose weight. This can be achieved by eating less, exercising more or a combination of the two. This section explains the importance of balanced nutrition and outlines the different nutrients you need to keep your body in good shape. Sleep is important because it helps all of your body systems function efficiently, including metabolism. The value of exercise for weight loss is simple. You have to move it to lose it. Oats, pasta, pita bread, bran cereal, blueberries, strawberries, banana, applesauce, pinto beans, eggs, cheese, fat-free yogurt, skim milk, Cool Whip, salsa, peanut butter, hummus. If you add exercise to your weight management plan you can consume more calories in your diet. You are encouraged to exercise for 60 minutes a day. If you don’t have time to do it all at once you can break it up into smaller sessions. Ideally you should do resistance training two or three days a week and aerobic exercise on the other days. 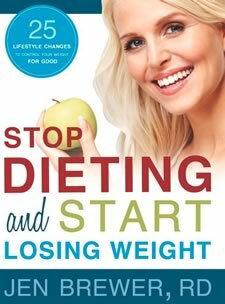 Stop Dieting and Start Losing Weight: 25 Lifestyle Changes to Control Your Weight for Good retails at $12.99. Offers practical tools that have been proven to increase the chance of successful weight loss. Can be adapted to suit the lifestyle and preferences of each individual. Offers a small selection of recipes for breakfast. Includes inspirational testimonials directly related to the individual tools. Only includes recipes for breakfast. Some of the recipes contain unhealthy ingredients such as white sugar and white flour. Does not provide adequate guidance for selecting healthy foods for lunch, dinner and snacks. Weight loss may be slower than desired. This book does not provide a structured weight loss plan but rather offers a series of tips and practical strategies. It will appeal to dieters who prefer a flexible approach easily adapted to their lifestyle and personal preferences.